Moving your garden herb plants indoors during the winter can provide you with fresh herbs and fragrant air throughout the deary winter months. Chives, parsley, tarragon, oregano and thyme are ideal for growing indoors during the winter because they can grow in lower light and they regenerate after you harvest them. Herbs that do not do well over winter indoors are dill, coriander and garden cress because the plant dies after harvest and must be regrown with seeds. Using a hand trowel, dig up the herb plants you intend to move indoors. Keep as much of the soil on the roots as you can. Dig the herbs up a week or more before the first frost arrives. You can also purchase herb plants for growing indoors, or start seeds a month or two before you plan to move them inside so they will have time to develop a good root system. Plant your dug up herb into a pot that is one inch larger than the root size of your herb plant and filled with a good quality, well draining potting soil. Place your potted herb plant in a spot outdoors that has lower light than where the herb was growing in your garden. This is done to gently acclimate your herb plant to the lower light condition it will be living in indoors. Keep your potted herb plant in the lower light outside for several days to a week before moving it indoors. Place your herb plants in a bright, sunny window indoors that will receive at least four hours, and preferably six hours, of sun each day. If you do not have a window sill that will provide that amount of light, or if you wish to supplement the light, place a grow light or fluorescent light over your herb plants. These lights need to be close, three to six inches, to your herbs, and on for ten to fourteen hours each day. Keep the temperature where you grow your herbs at 70 to 75 degrees F during the day, and 55 to 65 degrees F at night. 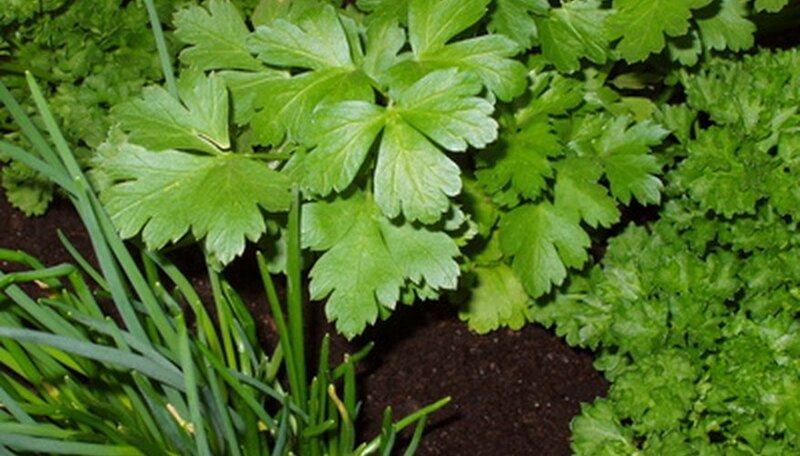 Herbs enjoy a cooler environment during the winter months, particularly at night. Water your herb plants to keep the soil moist, but never wet. It is better to allow the soil of your herb plants to dry out slightly before adding water during the winter months. Fertilize, if you feel you must, every four to six weeks with a diluted water soluble fertilizer. Generally, if you have planted your plants in rich, loamy potting soil, your indoor winter herb plants will not need additional fertilizer.